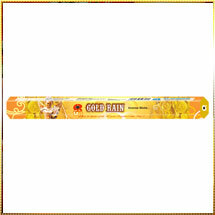 To agitate your senses with mesmerizing fragrances, we have bring forth an exclusive range of Incense Sticks served in the market under the brand name " Gold Rain". This collection of Incense Stick is popular in the market for offering unbelievably soothing and completely natural fragrance, the every breath of which you love to inhale. The rareness of its fragrance rely upon the premium grade materials we use during its preparation. fresh and natural herbs, flowers, and other biotic materials strengthen its lingering effects and offers a fragrance that mesmerizes all. Besides, we also focus on air-tight packaging that retain the fragrance for long time and is catchy, grabbing all eyeballs.